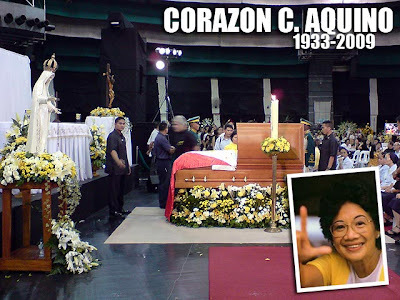 The Philippine nation mourns the loss of a true icon of democracy. Rich and poor, people continue to line up to pay their last respects to former president Corazon C. Aquino. 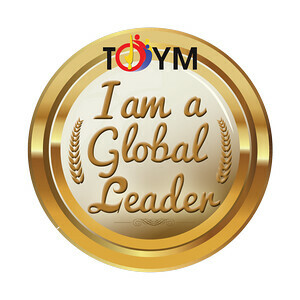 Today's generation of young people were born after the People Power Revolution of February 1986. So many do not feel the connection to the momentous events that took place that year. Although born during Martial Law, I was still six then. So my memories of what happened are a bit vague. But while reading some articles, things began to flashback. In fact, even images of 1983 still linger. I remember people in Makati throwing confetti from the buildings while me and my mom were driving by. Curious as I was, I asked why all these people were throwing pieces of paper (mostly shredded telephone directories) from the buildings. They were angry because of Ninoy's assassination. Today, as Cory's funeral cortege passes by Makati, her remains will be met with the very same confetti that honored and encouraged her as a widow, presidential candidate, and the nation's conscience. While on the way to Pampanga today, I encountered some traffic along EDSA and decided to take another route to the NLEX via Quezon Avenue. I noticed Times Street along EDSA and took this as a sign that I should stop by the house of Ninoy and Cory Aquino and pay my respects. Indeed, the house is small and humble compared to those in the vicinity. A crowd had gathered outside. TV cameras continuously covered the arrival of people who leave flowers or light candles by the walls of the house. A historical marker for Ninoy Aquino stands as a poignant reminder that in this house lived a national hero. Later in the evening, I received a message that the Upsilon Sigma Phi had been allowed special access to Cory Aquino's wake. Ninoy Aquino was a proud member of the Upsilon. And the brods were very appreciative to be given the chance to pay our respects. 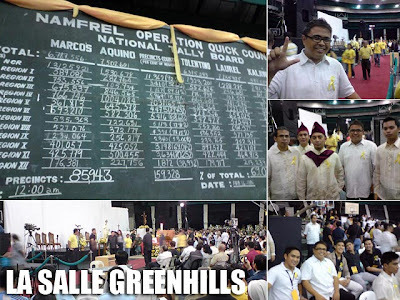 So I cut short my stay in Pampanga, immediately rushed back to Metro Manila and arrived at the gates of La Salle Greenhills just in time for the group to enter. The atmosphere was very solemn. Indeed, there was a multitude of people from all walks of life. The original Namfrel blackboard is still there, the chalk entries immortalized in white paint as a stirring reminder that we were once a nation that fought and stood for what was right. We only had a few seconds to pray in front of her coffin. I feel fortunate I got the chance. 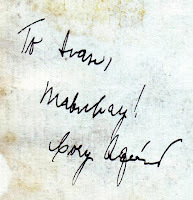 I keep one cherished memento of her, an autograph I was able to get when she visited the Ateneo de Manila High School. As she passed through the corridors on the way out, I rushed to shake her hand. I almost lost this autograph due to some water damage which my room is so prone to. But thank God it's still intact. I'm sad the family declined the state funeral she most definitely deserved. But I can't blame them. Kris Aquino puts it well, "Now she’s dead, you want to give her honor, but when she was still alive, you want her powerless." This government isn't fooling anyone except themselves. August 5, 2009 has been declared a special non-working holiday to allow the nation to join her funeral. Look at the stars, · Look how they shine for you, · And everything you do, · Yeah they were all yellow!